1933-1948 National Chicle, Double Play, Leaf, Plus Card and Pin Collection (69). 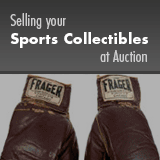 Offered is an enticing collection of almost seventy vintage baseball and football cards and pins. Includes: 1933 Tattoo Orbit Pins (1) - #55 Levey (VG+); 1934-36 National Chicle "Batter Up" (18) - #'s 84, 105, 121, 129 Lombardi (GD/VG), 135 (2), 143, 150, 154 Durocher (2: GD-pencil, PR), 159, 162, 170, 174, 177, 78, 180 Jackson (GD), 192, . Grades 33% VG, 67% PR to GD; 1934-36 National Chicle "Diamond Stars" (16) - #'s 29 Rolfe (GD-pencil), 33, 34 (2), 36 Lombardi/Error (VG/EX w/light pencil mark), 40, 4, 42, 45, 65, 68, 69, 71, 73, 74 Lazzeri (VG/EX), 91. Grades 50% VG to VG/EX, 50% lesser; 1935 National Chicle "Football Stars" (1) - #3 Kenneally (PR); 1938 PM8 "Our National Game" Pins (2) - Foxx and Ruffing. Both EX with bent tabs; 1941 Double Play (26) - #'s 5-6 Frey/Vander Meer (VG/EX), 15-16 Owen/Waner (GD), 25-26 (2), 27-28 (2), 29-30, 33-34, 39-40 Mize/Slaughter (VG), 55-56, 59-60 Cronin/Foxx (GD/VG), 107-108 Pytlak/D. DiMaggio (VG/EX), 109-110, 115-116, 123-124 (2), 125-126, 129-130, 133-134 (2), 135-136 (6). Grades 65% VG to VG/EX, 35% lesser; 1948 Leaf (4) - #'s 31, 42 Peterson/Black Cap, 86 and 102 Hermanski/Correct. All GD.